U.S. Vice President Joe Biden shakes hands with Palestinian Authority Presdient Mahmoud Abbas on Wednesday. Palestinian prime minister praises Biden's "strong statement of condemnation"
Ramallah, West Bank (CNN) -- The United States will hold both Israel and the Palestinians responsible for any steps that make peace between them more difficult, U.S. Vice President Joe Biden said Wednesday. He said both sides must "build an atmosphere of support for negotiations and not complicate them," specifically criticizing an Israeli announcement that it would build more apartments on disputed land. The move "undermines that very trust, the trust that we need right now in order to begin as well as produce profitable negotiation. That is why I immediately condemned the action," Biden said. Israel announced Tuesday it would build 1,600 new apartments on land which both Israel and the Palestinians claim. The Palestinians contend the area is in East Jerusalem; Israel's Interior Ministry says it is not. Biden referred to the disputed site as being in East Jerusalem -- land which Israel captured from Jordan in the 1967 war. Palestinian negotiator Saeb Erakat reacted to the announcement with fury and despair. "The choice the Israeli government has right now is settlements or peace," a visibly agitated Erakat said on CNN's "The Brief." "Stopping settlements is not a Palestinian condition, it's an Israeli obligation under the road map," he said, referring to the internationally backed peace plan. "They did not stop settlements, they did not stop incursions, they did not stop dictation ... who is to be blamed now? "This kills the process, this kills the efforts being exerted to revive the peace process," he said. "Why would the Israeli government ... why would they throw in the face of Mr. Biden 1,600 housing units knowing that this undermines the efforts being exhibited?" he demanded. Biden's unusually blunt criticism came after Israel and the Palestinians had agreed earlier in the week to indirect talks to be carried out with U.S. envoy George Mitchell. In announcing that both sides had agreed to start the indirect talks -- a step toward prospective direct negotiations -- Mitchell called on Israel and the Palestinians to avoid any actions that would threaten the talks or their outcome. Wednesday, Biden repeated that the construction plan undermines the trust needed to reach a peace deal. The timing of the announcement left many wondering whether it was a calculated slap in the face of the United States or simply undiplomatic timing. Israeli Prime Minister Benjamin Netanyahu's office told Biden it was the latter, an Israeli government spokesman said. "We were also taken a bit by surprise," said Israeli spokesman Mark Regev. "This was a local zoning and planning board." "It's not the job of the prime minister to be involved in local zoning board decisions," he said. A spokesman for Biden declined to answer repeated questions about what the Israelis had told the American vice president. Palestinian Prime Minister Salam Fayyad said his side appreciated "the strong statement of condemnation by the U.S. administration." Biden met with Tony Blair, the former British prime minister now acting as representative of the "Quartet" of powers pushing for peace between Israel and the Palestinians, on Wednesday before meeting Palestinian Authority President Mahmoud Abbas. 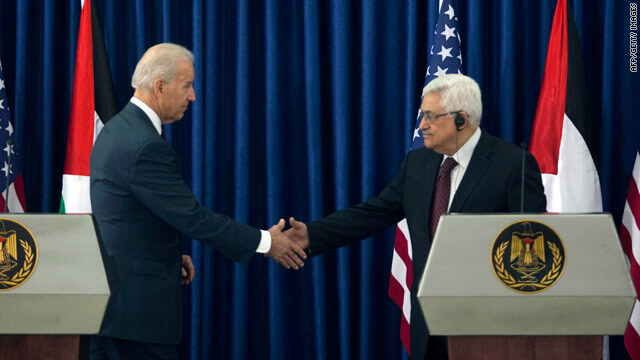 Neither Biden nor Abbas took questions from the media in their joint appearance. Biden arrived in Israel Monday and met with Israeli President Shimon Peres. He had dinner Tuesday night with Netanyahu. In Jerusalem before the announcement of the new apartment building, he insisted that Washington's position on Israeli security was identical to the Jewish state's own. "There is absolutely no space between the United States and Israel when it comes to Israel's security -- none at all," Biden said. Peres called Biden a "true friend" of Israel, and Biden said, "It's good to be home." Biden is the highest-ranking member of the Obama administration yet to visit Israel. He is scheduled to deliver a major speech at Tel Aviv University Thursday titled "The Enduring Partnership Between the United States and Israel." Biden also plans a one-day trip to Jordan at the end of the week, when he will meet with King Abdullah. CNN's Paula Hancocks, Shira Medding and Kevin Flower contributed to this report.